On your marks, get set...shop! Shopper at this Toys"R "Us in Fort Worth, Texas don't need to stinking advice. The day after Thanksgiving has been dubbed America’s “cloggiest” day of the year. Nov. 27 is also known as Black Friday, but don’t feel bad for sleeping in -- retailers reportedly plan to keep the deals coming through the new year. If you do hit the mall today, remember these tips before your credit card bill rolls in. Get there early if you want to snag Zhu Zhu Pet, the battery-powered hamster. “There are two pieces of Black Friday mythology…that stand up to scrutiny," Alyssa Demirjian blogs for BookofOdds. "The first is shoppers’ eagerness to get the best bargains—or at least the best parking spaces—by showing up early: One in 1.75 (57%) shoppers will leave the house before 7 a.m. to get a jump on Black Friday sales. The second is that among those who shop, the clamor for the hottest items can be fierce.”So, what’s a myth? Not everyone shops on Black Friday, Demirjian writes. Odds are closer to 1 in 8.33. If you’re the planning type, here are two sites to check out: PCMag aggregates the six best Black Friday Web Sites; Black Friday Ads lays claim to being that rare Internet phenomenon: a shameless click-ad site that’s actually useful. Don’t be fooled by cheap TVs, HD Guru writes. Walmart’s 32” Emerson HDTV seems like a bargain at $248. But once your 90 days labor/1 year parts warranty runs out you could on the hook for $150 to $250 in repairs should it break. HD Guru also recommends passing on unnecessarily pricey HDMI cables. Salon's Mary Elizabeth Williams caught up with the author of “Scroogenomics” who recommends only buying gifts for BFFs. Otherwise, it’s an unsatisfying experience. “Normally if I spend $50 on myself it's for something worth at least $50 to me. If I spend $50 on you, and I don't know what you like or already have, I could buy something that's worth nothing for you. That's a loss. The average difference in gift satisfaction between the giver and recipient is about 20 percent.” Is your head spinning? Slate’s Farhead Manjoo sums up the negator's perspective: Black Friday is for suckers. 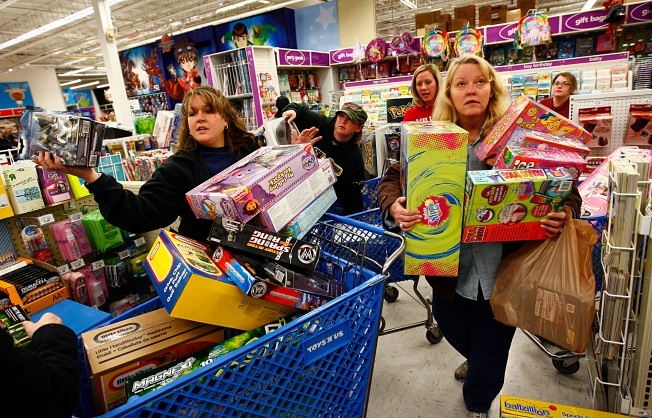 “The biggest worry on Black Friday is that you'll buy stuff you don't need,” he writes. “For retailers, that's the entire point of Black Friday—they're hoping that, in your quest for bargains, you'll buy an electric toothbrush or radio-controlled rubber rat just because it's on sale.” For the record, Manjoo recommends avoiding E-book readers, netbooks, and cheap inkjet printers. No deals there.